I’m a week behind in the challenge and I dislike that nagging feeling that I let time get away from me. Now I have two posts to write! Procrastination is my middle name, but I’ve always managed to meet a deadline. Not this time, unfortunately. I can partly blame Google Glass, which I’ve been learning to use, so my mind has been occupied with that! The big news this week for those of us with ancestors from Pennsylvania was the release of Pennsylvania death records on Ancestry.com. It’s not just an index, but actual images of death certificates! For now, the coverage is from 1906 – 1924, but more will follow, along with birth certificates coming up in 2015. This was the perfect opportunity for me to find out what happened to my grandfather’s first wife, Jane McGarry. No one in the family knew much about her. All I ever heard was that she died giving birth to her second child, a son. I have a photograph of my grandfather holding his son on his lap; his daughter sits next to them. It must have been taken not long after Jane died. 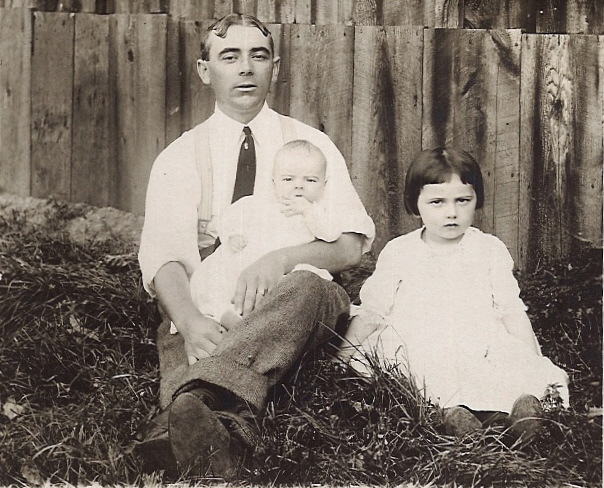 John W. Judge (1881 – 1972), holding his son Robert, with daughter Agnes sitting next to them. 1913. From the 1920 census, I knew that baby Robert Judge was born about 1913, so Jane had to have passed away that year. She and my grandfather married in 1907, which I deduced from the 1910 census, where it stated that they had been married for 3 years. 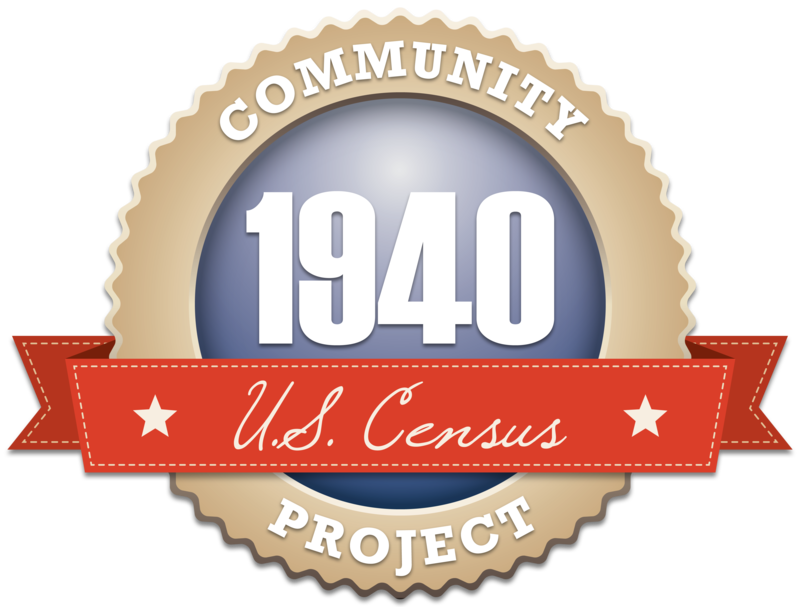 That census was the only one in which Jane and my grandfather were listed together. They were living in Morris Run, a coal mining community in Tioga County, Pennsylvania. I searched for Jane’s death certificate on Ancestry.com and found it easily. And I learned a lot from it. 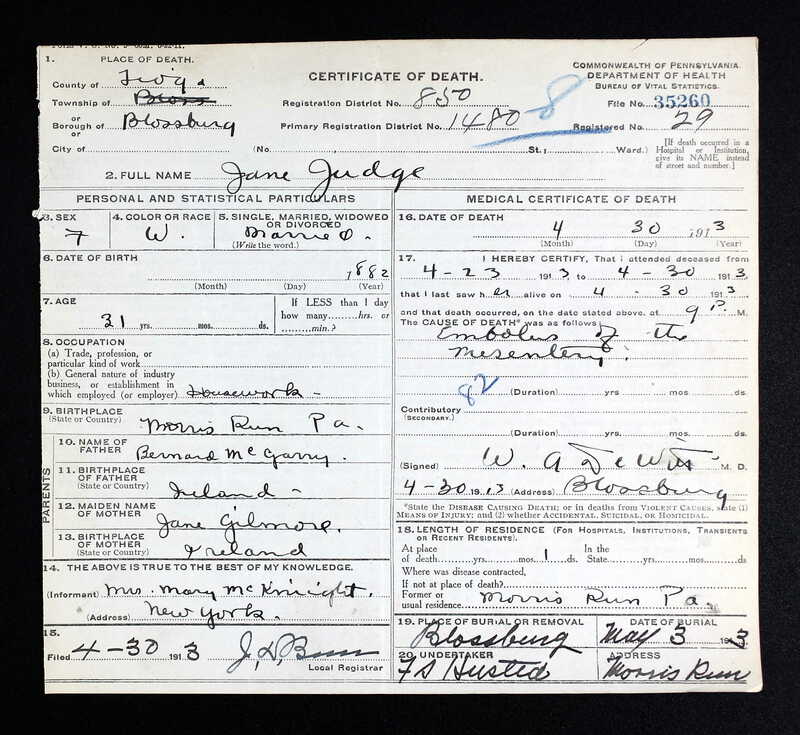 1913 Death Certificate, Jane McGarry Judge (1882 – 1913). Click on the image to enlarge. She died April 30, 1913. If her son Robert’s date of birth (March 31, 1913) on the Social Security Death Index is correct, then she died 1 month after he was born. The cause of death given was “embolus of the mesentery.” From what I can tell, this is an obstruction of an artery in the intestinal region. Appendicitis or a pelvic inflammation can cause the obstruction (among other conditions), so I’m still not sure if her death was a result of childbirth. She was only 30 years old. And she left behind an infant and a 3-year-old. A sobering thought. The certificate gave me other information, such as the names of Jane’s parents, the fact that she was born in Morris Run, and that she was being treated for her medical condition for a week before she died. The informant for the death certificate was not my grandfather, though. Mrs. Mary McKnight from New York was the name of the informant. I don’t know who she might be. Someone who was caring for Jane? Someone who came to help with the children? I’ll have to do some research to find out. I have some other Pennsylvania certificates to search for, too! In the 1920 census, Robert was listed in the household of his aunt Sarah. Agnes was with her aunt Isabel. Both aunts were their father’s sisters, so they must have taken care of the children while my grandfather worked. My grandfather eventually married for a second time about 7 years after Jane’s death.